Do you bathe your baby in a regular infant tub? One that is just a plain plastic bin? Do you have trouble knowing if the water temperature is just right? Has your baby ever peed or pooed in the water, so you have to dump out the water and start the bath over again? Then you are in luck! The 4moms Cleanwater Infant Tub solves these problems for you. First of all, there's a built in thermometer, so you never have to worry about water being too cold or too hot. Babies have sensitive skin, so they hate bathing in cold water more than you do. And water that’s too hot is no good, either. The tub’s built-in digital thermometer makes it easy to set a perfect temperature every time. 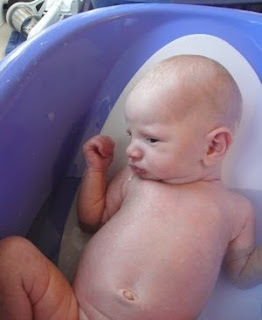 Most infant tubs hold a small amount of water that gets dirty and cold during bathing. The Cleanwater Infant Tub has a special hole in the side to drain out dirty water, and the tub is constantly being filled with fresh, clean water from the tap. Clean water ﬂows into a reservoir before entering the bathing area, so you never have to rinse your baby in the dirty, soapy water she’s been sitting in. There’s also a rinse cup that securely locks into either of two cupholders and is perfectly sized for the Clean Water Reservoir. I am in LOVE with my Cleanwater Infant Tub. 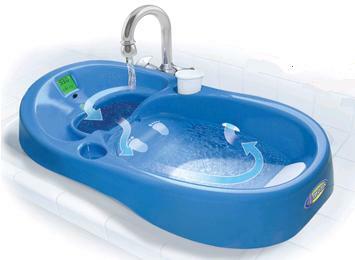 The tub fits right into my kitchen sink (and can even be used in double basin sinks), and it can be used for babies from birth to approximately 6 months. 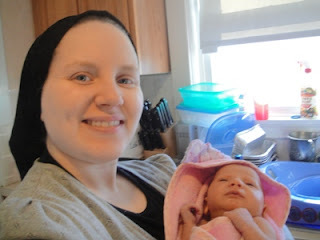 When I bathe the baby, I am completely reliant on the temperature gauge, because I have no idea what would be a good water temperature for her. I just keep my eye on the thermometer so I know she's comfortable. There are also two different drain heights, so I can keep the water at a safe level for her now and then have a slightly higher level as she gets bigger. Also, having the dirty water drain out is essential. The very first time I gave her a bath in the tub, she peed. Luckily, I knew that that water was on its way out and clean water already replacing it. So I was able to continue giving her a bath without any concern. The Cleanwater Infant Tub truly makes bath time easy, and it's even won numerous awards (The National Parenting Center’s Seal of Approval, the iParenting Media Award, and the Mom’s Best Award). I highly recommend buying this tub to use for your baby! Overall: We give the 4moms Cleanwater Infant Tub a 10/10! One very lucky reader will win a Cleanwater Infant Tub from 4moms! First, visit 4moms online. Then, comment here and tell me about another of their products you'd love to try. 2) Follow @4moms on Twitter and comment here with your Twitter screenname. 5) Become a fan of 4moms on Facebook! 9) Sign up to become a 4moms Insider. This giveaway will close on February 4, 2011 at midnight. 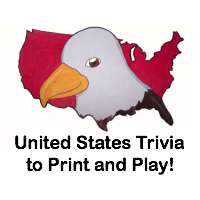 You must live in the continental US to enter. The winner will be picked via random.org and will have 48 hours to respond to my email or another winner will be chosen. We were sent the 4moms Cleanwater Infant Tub free of charge for the sole purpose of this review; no other compensation was received. All opinions expressed are my own. The mamaroo looks like a great fun product too! Would love to win this tub! I Publicly follow this blog on Google Friend Connect - emillie. I Follow @4moms on Twitter - hisprincess886. I Follow @TheTwinners on Twitter - hisprincess886. I shared the giveaway on twitter - http://twitter.com/#!/HisPrincess886/status/28556123015479296. I am a fan of The Twinners Reviews & Giveaways on Facebook - emillie rose. I follow Elana's Musings - gfc - emillie. I Subscribe to The Twinners emails - using my @gmail.com address. I would love to have the origami. I have a bad back and it electronically folds. It would be great to have something like that and all of the other features are an extra plus! I am a 4Moms insider. i've been wanting a mamaroo ever since they were first advertised! I follow 4moms on twitter @Aerated. I follow TheTwinners on twitter @Aerated. I follow your personal blog with GFC. I voted on Top Mommby Bloggers. I entered your ReliaDose giveaway. I voted today on Top Mommy Blogger. I voted today on Top 100 Blogs and Websites. I voted today on Baby Boutique. I voted on To Baby Blogs. I voted on To Mommy Bloggers. I voted on To 100 Blogs. I would also love to try the MamaRoo! The mamaroo looks pretty cool to me! I entered the Party goods giveaway. I voted for you on Top Baby Blogs 1/23. I voted for you on Top Mommy Bloggers 1/23. I voted for you on Top 100 Blogs 1/23. I voted for you on Baby Boutiques 1/23. I love the Mommyroo seat! I would also love the Origami stroller. It sounds like it is going to be really cool! I'd like to try the mamaRoo. This tub would sure come in handy, my daughter is having a baby in a few days. Please enter me. Thanks! I would love to try their mamaRoo! I voted for you on Top Baby Blogs 1/25. I voted for you on Top Mommy Bloggers 1/25. I voted for you on Top 100 Blogs 1/25. I voted for you on Baby Boutiques 1/25. I voted for you on Top Baby Blogs 1/26. I voted for you on Top Mommy Bloggers 1/26. I voted for you on Top 100 Blogs 1/26. I voted for you on Baby Boutiques 1/26. I voted for you on Top Baby Blogs 1/27. I voted for you on Top Mommy Bloggers 1/27. I voted for you on Top 100 Blogs 1/27. I voted for you on Baby Boutiques 1/27.